Shop our collection of Magnetic Snap Gift Boxes and find the best way to present your pieces: bracelets, earrings, pendants, rings & necklaces! Explore lots of designs, with ribbon or satin interior, made of cardboard, in colors such as white, black, red & more, with a hidden closing system. 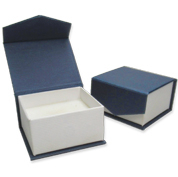 Perfect for packaging & retail jewelry sales, all at wholesale special prices!